Now the big question, how many missile slots do torrents have? 1 or 2? Obi wan ****** Kenobi + Baby Vader + Sam ****** Jackson + 3x 7B title = stupid fun good time. Now how many points do i have to spare? I think that will be a close fit as is. More than 10 points would be kind of surprising and more than 20 seems very unlikely. The base pilot is probably 40 points. Obi and Mace are probably high 40s or 50. Anakin is probably mid 50s. And the 7B config is probably 8 to 12 points. What's this 7B title? I can't seem to find that anywhere? Awesome sauce, hadn't seen it! So can you use fine tuned controls after you execute a red manuver? Or no because you would be stressed? And is that in addition to another standard action? No because you're stressed, and yes. It'll be more than that. The Grand Inquisitor, on a similar chassis, is 54. Mace and Obi-wan will start at 60. I'm betting they'll be in the low 70s with the mod, with Anakin probably hitting 80+. Still limited by the not stressed requirement to use the actions the ship ability permits, those actions don't cause stress though (swaps out the stress cost of the TIE/In ship ability for costing a Force Charge). Not quite. It triggers after the manoeuvre, presumably in order to stop higher Force pilots being able to double reposition with it and still get their normal action. Which you KNOW they would. Ya, I blipped over the timing change despite it being right in front of my nose. Eh... it will be close. Think about it this way, naked Vader in the x1 is only 65 points. I am not sure Obi or Mace with the 7B upgrade is more powerful the Vader, though it's certainly close. Anakin is going to be the question mark. I should have said low 50s for the Mace and Obi price range I think though. The Rebels can also do it. Kanan, Luke, and Ezra in the attack shuttle with Maul comes in at 198. And the Inquisitors can evade force token every turn. Can’t link it to reposition or target locks though. Seventh Sister I gave a spin this week. She’s actually feeling pretty good! With FCS she was a decent little sniper. Add hate for extra defense. I think I used her ability three times in one game, Vessery was taking the focus, and she used it to kill Poe even. Weird thing, using her ability when your opponent rolls blank, blank, Evade and Poe has Heroc leads to an interesting situation. Does this now allow Heroic to trigger? We ruled it did, because attacker mods dice first. And I ‘cancelled’ the Evade result, meaning now he had blank blank, and that allowed Heroic to trigger. But an odd edge case we hadn’t considered! If true that may be kinda neat. Double action for no stress? Soontir only wishes he could do that every turn. No double mods, though, and one of those actions costs you a mod, so it's not THAT great. Happens after the defender mods their dice so no. Yeah, it says right on the cqard when it happens, which is after all the Modify Dice steps, because cancelling dice is not a mod. Vader is much worse. He can't double reposition, can't boost at all, can't evade at all, and -1 shield for +1 agility is not an even trade off. Again, the Grand Inquisitor, who just got his points adjusted, is 54. He is the single most similar pilot in the game to Mace and Obi-wan, but slightly worse at -1 force. You're expecting them to cost less than him, rather than slightly more? Limits, yes, but what is better? Having double mods, or not being shot at all. Depends on the game state really. Sometimes taking a lock and going **** bent for leather is the right call. Others boost - roll to dodge everything and leave your dial completely open is better. We all know how effective Soontir is. Now imagine his shenanigans when you don’t even take a stress and have your whole dial open. Its really good. But you can always just lock and save the force for attack. Oh, I completely goofed then! It only came up once, and he refilled into blank focus anyhow, and had no focus thanks to Vessery. Played it like Crack Shot. A little better then, and a nice counter to Heroic. You're right about the Inquisitor being a better comparison. But 6 points more seems like a lot for 1 more Force. And remember Made is only init 4. I still maintain it will be close. Mace is I5 in English and I4 in Polish. Going to assume the first one is correct, but true, if he's I4 I agree he's probably in the low 50s. How much a force point is worth is an interesting discussion though. 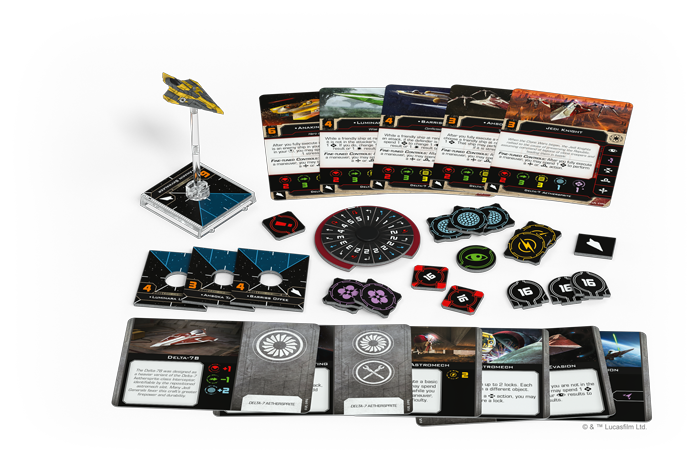 Seventh Sister costs 8 points more than an Inquisitor, but also gets +1I and a pilot ability. So maybe 4-5 points? That would place Obi-wan (and maybe Mace, depending on initiative) in the high 50s. I missed the I5 in English, that does excite me a little. With that in mind, I don't think you will get Anakin, Obi, and Mace all in 7Bs for under 200. I do think you will get Obi, Mace, and Plo in them though (though with less than 10 points to spare). Woah 3 i5 Jedi? That’ll be worth toying with even if you can’t fit the 7B config on all of them.